Post - Carolina Bride - A Cover Issue! 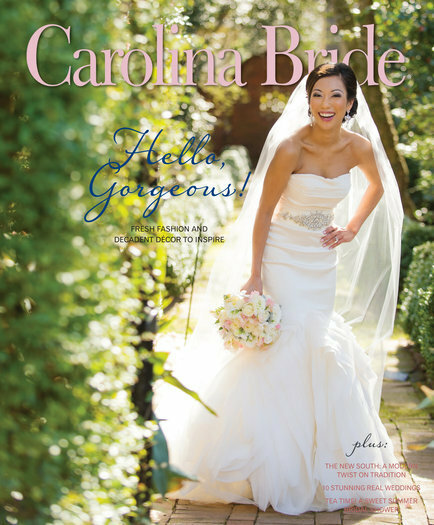 Carolina Bride - A Cover Issue! Recently, one of Split Second Sound’s DJs took the covers of Carolina Bride (yes, both of them)! DJ LeVar ‘Mista LG’ Gladden wasn’t featured by name but two of his brides were. We love seeing our brides throughout Carolina Bride magazine in each release but this is the first time where the same DJ had two different brides making appearances on both the front and back covers of the same issue! LeVar’s April 26th bride, Veronica Acut (now Getz) was featured on the front cover wearing a stunning Vera Wang gown. Inside the magazine, we can read all about Veronica and her groom, Chip’s beautiful reception which took place at Mint Museum Uptown. Other vendors included some of our favorites: Ashley at Graceful Host, Lindsay Reagan Thorne at Be Pretty and Jeremy Igo! On the back cover of the magazine, Indigo photography featured LeVar’s upcoming September 20th bride and groom, Jenna Bertram and Adam Nygaard in an up close and personal engagement shoot. Jenna & Adam’s reception will be hosted at a beautiful venue (and another of Split’s favorites), Foundations for the Carolinas.